Tacoma LINK expansion work will close the southbound lanes of travel in one direction from South 11th Street to Ernest Brazil Street sometime this morning. Notice is hereby given that the Pierce Transit Executive Finance Committee (EFC) meeting of Thursday February 28, 2019, has been cancelled. A public hearing will be held as part of the Board of Commissioners’ meeting on Monday, February 11, 2019. A public hearing will be held as part of the Board of Commissioners Meeting on Monday, January 14, 2019, at 4:00 PM. Notice is hereby given that the Pierce Transit Executive Finance Committee (EFC) meeting of Thursday December 27, 2018, has been cancelled. The Pierce Transit Board of Commissioners Regular Meeting scheduled for November 12, 2018, at 4:00 p.m. has been rescheduled to November 15, 2018, at 10:00 a.m. due to the Veteran’s Day Holiday. The purpose of the Public Hearing is to obtain comment and feedback from citizens on the proposed 2019 Budget. Notice is hereby given that the Pierce Transit Executive Finance Committee (EFC) meetings of Thursday October 25, 2018, and November 22, 2018, have been cancelled. We are South Sound Proud! 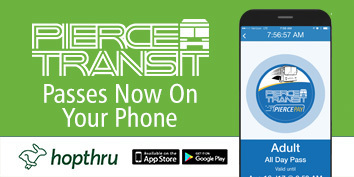 Pierce Transit has a new look with a refreshed logo! Notice is hereby given that the Pierce Transit Executive Finance Committee (EFC) meeting of Thursday, June 28, 2018, has been cancelled. Notice is hereby given that a public hearing will be held by Pierce Transit as part of the Board of Commissioners meeting on April 9, 2018. Notice is hereby given that the Pierce Transit Executive Finance Committee (EFC) meeting of Thursday, March 22, 2018, has been cancelled. New Trips, New Ways to Get Info! Two new Route 497 bus trips began January 8 to meet the Sounder peak hour commute train service. A public hearing will be held as part of the Board of Commissioners’ Special Study Session meeting on Monday, November 13, 2017 at 3:00 PM. The Pierce Transit Board of Commissioners will hold a Special Study Session Meeting on Monday, October 9, 2017, from 3:30 p.m. to approximately 4:00 p.m.
Couldn't make it to one of our open houses? Not a problem. 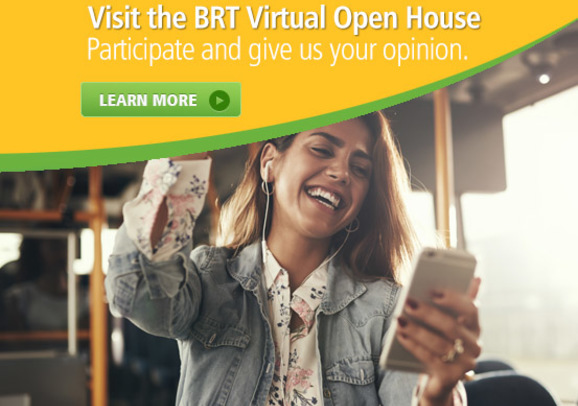 We've created a Virtual Open House where you can learn more about HCT and provide feedback. Notice is hereby given that the Pierce Transit Executive Finance Committee (EFC) meeting of Thursday, August 24, 2017, has been cancelled. The next EFC meeting is scheduled for Thursday, September 28, 2017 at 3:00 PM. Pierce Transit’s draft edition of the Transit Development Plan (TDP) covering 2017-2022 has been filed with the Clerk of the Board. Notice is hereby given that the Pierce Transit Executive Finance Committee (EFC) meeting of Thursday, June 22, 2017, has been cancelled. The purpose of the hearing is to allow public comment on a proposed increase to the SHUTTLE fare. The purpose of the meeting is for the Board to review and discuss the Agency’s Strategic Plan for purposes of aligning its mission, vision, and goals. In honor of Roy Stevens’ memory, you are invited to attend a candlelight vigil being held this evening, Friday, February 24 at Pierce Transit headquarters. Notice is hereby given that the Pierce Transit Executive Finance Committee (EFC) meeting of Thursday, November 24, 2016, has been cancelled due to that it falls on the Thanksgiving Day holiday. Notice of Public Hearing for proposed sale of surplus property. Notice is hereby given that the Pierce Transit Executive Finance Committee (EFC) meeting of Thursday, March 17, 2016, has been cancelled. Pierce Transit's draft edition of the Long Range Plan, titled Destination 2040, has been filed with the Clerk of the Board. A copy of the entire draft plan, including the appendices, is available for review and comment until April 1, 2016. Customer Service is experiencing intermittent phone system issues. We appreciate your patience as we work on the situation. On Dec. 14 the Board of Commissioners passed a measure enacting changes to senior, disabled, youth and SHUTTLE fares effective March 1. Pierce Transit is accepting applications to fill three current vacancies on its Community Transportation Advisory Group (CTAG). The purpose of the Public Hearing is to obtain comment and feedback from citizens on the proposed 2016 Budget. Notice is hereby given that a public hearing will be held as part of the Pierce Transit Board of Commissioners' meeting on November 9, 2015. 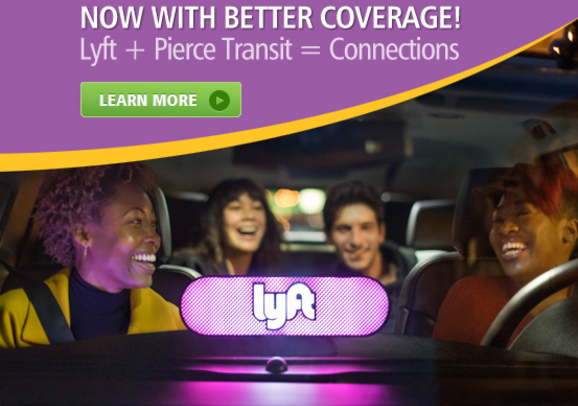 Pierce Transit will reintroduce express service between Northeast Tacoma and downtown Tacoma. The new Route 63 is a one-year pilot project to test demand for the service. Notice is hereby given that the Pierce Transit Executive Finance Committee (EFC) meeting of Thursday, September 17, 2015, has been cancelled . Pierce Transit has received an unsolicited Transit Oriented Development proposal for its Transit Center site at 1319 East 72nd Street, Tacoma WA, APN # 9160000592. The Transit Development Plan (TDP) reports on Pierce Transit's annual operating budget, capital investments, and business strategies, and is submitted to the Washington State Department of Transportation annually. Notice is hereby given that the Pierce Transit Executive Finance Committee (EFC) meeting of Thursday, June 18, 2015, has been cancelled due to lack of agenda items. The next regular EFC meeting is scheduled for Thursday, July 16, 2015 at 3:00 PM. 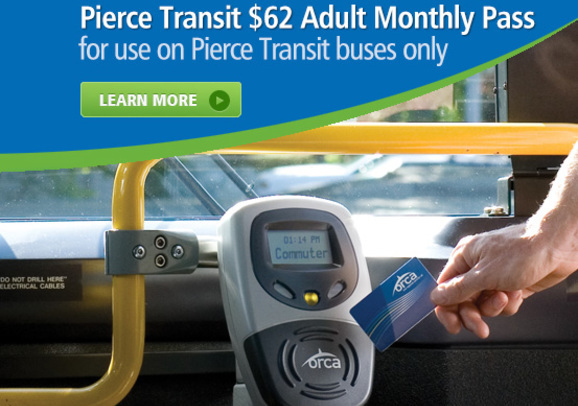 Pierce Transit will increase bus service by an additional 12,000 service hours. The additional service will focus primarily on increasing span of service to weekends and increased weekday frequency on several routes. This June is a month-long celebration of transit. Whether you ride a bus, train, or vanpool, or you are headed to work, school, the grocery store, or anywhere in between, transit can get us there together. Be on the lookout for a Pierce Transit patriotic themed bus. Pierce Transit continues its commitment to safety with the installation of cameras on buses. By the end of May, every bus in the active fleet will be equipped with interior and exterior cameras capable of capturing video and audio recordings. Notice is hereby given that the Pierce Transit Executive Finance Committee (EFC) meeting of Thursday, April 16, 2015, has been cancelled due to lack of agenda items. The next regular EFC meeting is scheduled for Thursday, May 21, 2015 at 3:00 PM. Following a pilot program last year, the transit agencies participating in the ORCA smart card system are proposing to implement a permanent Regional Day Pass program. The Pierce Transit Board of Commissioners will hold a special meeting on Wed., April 1, 2015, at 6:30 PM. Notice is hereby given that the Pierce Transit Executive Finance Committee (EFC) meeting of Thursday, March 19, 2015, has been cancelled due to lack of agenda items. Notice is hereby given that the Pierce Transit Community Transportation Advisory Group (CTAG) meeting of Thursday, March 19, 2015, has been cancelled. The Pierce Transit Executive Finance Committee will hold a Special Meeting to interview, evaluate and discuss prospective candidates that applied for the position of Chief Executive Officer of Pierce Transit. The purpose of the hearing will be to accept oral and written testimony relevant to the fare revision proposal. The Pierce Transit Board of Commissioners will hold a special meeting on Thursday, December 18, 2014, at 3:00 PM. The Pierce Transit Executive Finance Committee will hold a special meeting on Thursday, October 2, 2014, at 11:00 AM. The purpose of the hearing is to allow public comment on proposed changes to Pierce Transit Bus Route 503 Fife to Puyallup and Route 504 Edgewood/Milton that will be effective February 15, 2015. The purpose of the hearing is to allow public comment on the disposition of the Bonney Lake Park and Ride property and the sale of said property to Sound Transit. Notice is hereby given that the Pierce Transit Executive-Finance Committee (EFC) meeting of Thursday, June 19, 2014, has been cancelled. 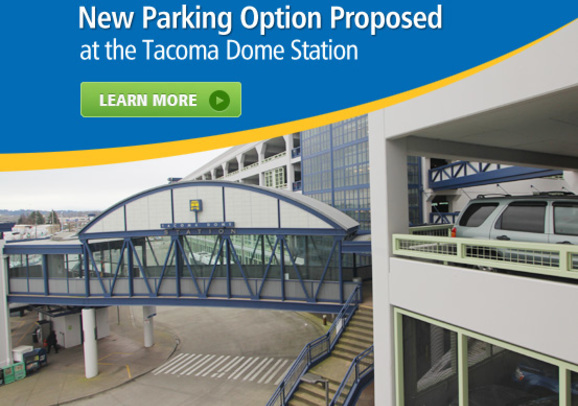 On Monday, June 23rd, Pierce Transit will be closing the easternmost gate of the Tacoma Dome Station, along East G Street. Pierce Transit is the way to go to work, school and events! You may be curious about why five Pierce Transit routes have recently shifted from Commerce Street to Pacific Avenue. Notice is hereby given that the Pierce Transit Executive-Finance Committee (EFC) meeting of Thursday, September 19, 2013, has been cancelled. The Pierce Transit Board of Commissioners will hold a Special Board Meeting on Wednesday, July 31, 2013, at 4:00 PM. July 19, 2013, Pardon our progress! Pierce Transit is making improvements to the Parkland Transit Center and Park and Ride. The Pierce Transit Board of Commissioners will hold a Special Meeting/Study Session on Monday, June 10, 2013 at 3:00 PM. On Memorial Day, Monday, May 27th, Pierce Transit bus and SHUTTLE services will operate on a Sunday schedule. On Presidents' Day, Monday, February 18th, Pierce Transit services will operate on a regular weekday schedule. The Community Transportation Advisory Group (CTAG) of Pierce Transit will hold a special meeting in the Rainier Room of the Training Center Building at 3720 Ã¢ï¿½ï¿½ 96th Street SW, Lakewood, Washington, on Thursday, January 31, 2013, at 5:30 pm. Notice is hereby given that a public hearing will be held as part of the Board of Commissioners' meeting on February 11, 2013. LAKEWOOD, WA - On Martin Luther King Jr. Day, Monday, January 21st, Pierce Transit services will operate on a regular weekday schedule. he Pierce Transit Board of Commissioners will be holding a special public hearing on June 4, 2012 at 4:00 p.m. to take comments on a ballot resolution to utilize Pierce Transit’s remaining taxing authority. "It is my job to make every passenger feel welcomed, comfortable, appreciated and to get them to their final destination safe and on time."